Seen This Pic Of Amitabh, Jaya, Aishwarya And Abhishek Bachchan? Of late, superstar Amitabh Bachchan is on a nostalgia spree. 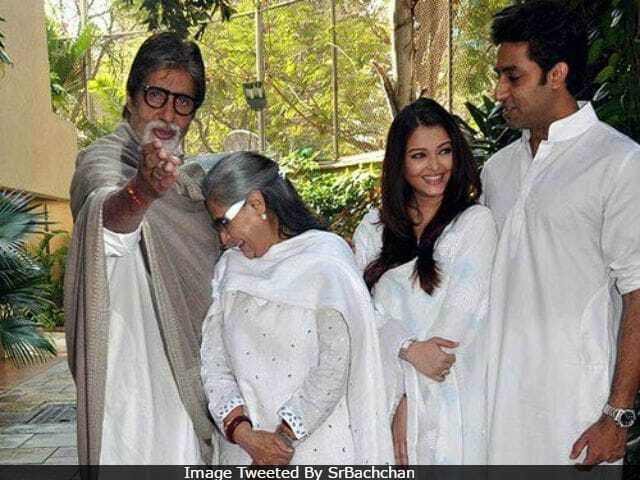 After sharing some throwback photos of his son, actor Abhishek and his Allahabad home just a couple of days ago, the 74-year-old actor has now posted a picture of himself with wife Jaya Bachchan, son Abhishek and daughter-in-law Aishwarya Rai. The picture features Bachchans with a big smile on their faces. (Thank you for this pic, Mr Bachchan). The only one's missing is Abhishek and Aishwarya's five-year-old daughter Aaradhya. Big B and Jaya Bachchan, who have been married for over 44 years, also have a daughter Shweta, a columnist. Here's the picture shared by Big B. Check out the other throwback pictures which Amitabh Bachchan shared recently. Amitabh Bachchan is currently in Malta, where he is shooting for Thugs Of Hindostan, with Aamir Khan and Fatima Sana Shaikh. Aamir and Fatima have co-starred together in Dangal. Thugs Of Hindostan also stars Katrina Kaif, who is now promoting Jagga Jasoos, her upcoming film Ranbir Kapoor. Katrina is expected to join the cast later. Big B flew out of Mumbai for Thugs Of Hindostan shooting a couple a weekends ago. He updated about his schedule on his official blog. This Sunday, Big B posted about going for a movie with Aamir and Fatima. "A Sunday and stepped out with my co-stars Aamir and Fatima to a movie .. walking care free on the streets, to a movie theatre ! YO," he wrote on Twitter. Thugs Of Hindostan is Amitabh Bachchan and Aamir Khan's first film together. The film is directed by Vijay Krishna Acharya. Thugs Of Hindostan releases next year during Diwali.